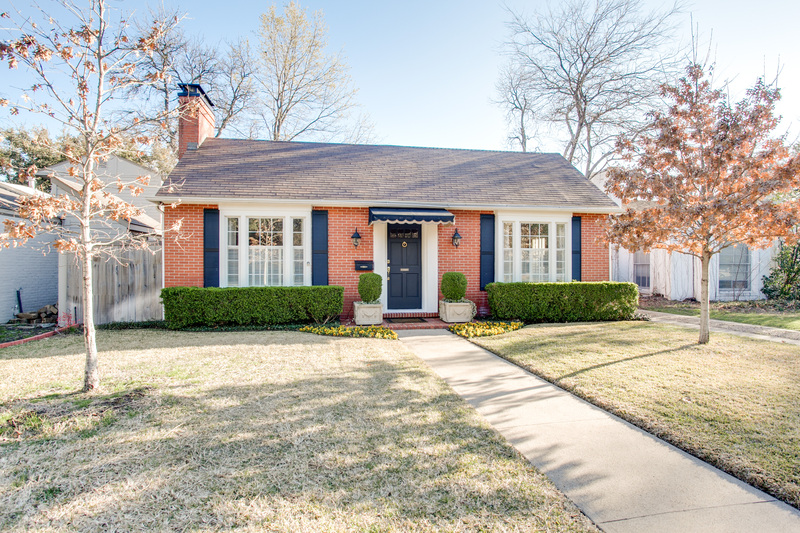 This sophisticated traditional home is situated in coveted West Highland Park with Highland Park Police monitoring and fabulous drive-up appeal! Details include 9-foot ceilings, gleaming hardwood floors, spacious entertaining areas, deep molding, plantation shutters, and lighting treatments throughout. The stylish home offers 1,436 square feet of living space, two bedrooms, two baths, elegant formal rooms, a patio, pool, guest quarters and two uncovered spaces. Enter to a spacious living room, which is centered by a wood-burning fireplace, with a marble surround and a wood-carved mantle, and also showcases handsome hardwoods, deep molding, recessed lighting and plantation shutters. Handsome hardwoods continue through an arched entry to the formal dining room, which is graced by an elegant brass chandelier and also flows to the kitchen. The updated galley kitchen features granite counters, new hardwood floors and premier stainless steel appliances, including KitchenAid and Jenn-Air, and also opens to the side grounds. A utility closet is adjacent and boasts room for a full-size stackable washer and dryer. Flanked by built-ins with bookshelves and storage, the oversized master suite is also appointed with two large closets and an elegant slate bath. The large bath is accented by a large vanity desk with Corian counters, a separate shower and also provides light-filled windows with scenic views and opens to the fabulous pool area. The second bedroom is generous-sized and also houses hardwood floors and ample closet space. The adjacent full bath is elegant and showcases a white pedestal sink with fabulous Ann Sacks white subway tile on the walls and white mosaic tile flooring. Outside, the backyard grounds are perfect for entertaining! The expansive patio overlooks a fabulous pool and spacious guest quarters, which feature a large living room with a vaulted ceiling and ceramic tile floors, a sink area, large closet and full ceramic-tiled bath. A manual iron gate and two uncovered parking areas complete this fabulous residence.